Join our eClub to receive exclusive specials and important club news. Browse tee times online and call our pro shop to schedule your next round. View our event calendar to see what golf tournament we're hosting next. We offer a variety of membership options, each brimming with benefits. To view the starting times, click here. Registration is NOW OPEN for the 9th Annual Derby Day Tournament at GHC! Cost $60.00 per person or $240.00 per team. For more information and an entry form, click here. Golf Outing for your organization! Welcome to the Greene Hills Golf & Swim Club! 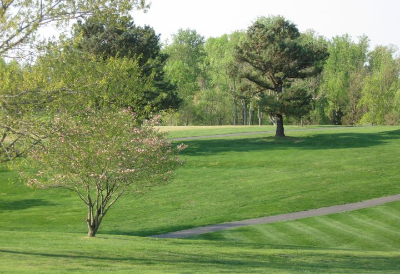 Located in scenic Central Virginia, this semi-private Greene County golf club offers a relaxing getaway for both the recreational and the wannabe pro-golfer, as well as an exciting outing for the entire family. With eighteen challenging holes on a beautiful 200+ acre course, you could spend the entire day encouraging your friends or beating your personal best. With a driving range, multiple practice areas and a fully-stocked golf shop, you'll never have to play unprepared. Are you or a family member interested in more than just golf? Enjoy our 25-meter swimming pool, which is equipped with a diving board and water slide and serves as home to the Greene Hills Gators swim team. For those interested in tennis, we also offer two tennis courts. End your day with a trip to The Hills Grille, where the staff is friendly, food is fresh and the drinks are cold. Try one of our made-to-order sandwiches from cheeseburgers to clubs, enjoy a nice tossed salad, or sample a tasty appetizer. Greene Hills hosts tournaments and events throughout each and every year. Members and guests compete for fame and prizes or just a chance to mingle with other golfers. Greene Hills is proud to have one of the largest and most active Ladies Golf Associations (LGA) in Virginia. The LGA participates in a number of Central Virginia leagues across all skill levels. The senior men's league competes across the state. For over 50 years, Greene Hills has offered members and guests, a challenging golf course, a variety of family friendly activities and an opportunity to relax at the Hills Grille. Stop by anytime to see how you and your family will enjoy Greene Hills. You will hear, "Welcome to the Hills!"